Although most of the hype at this year’s CES in Las Vegas surrounds wearables, one area that is also attracting plenty of attention is anti-collision technology, or ‘smart mobility’ as Ford chooses to call it. The idea is that with more cyclists and drivers on the road than ever before, coupled with an ageing population, it’s becoming increasingly important to use all the technology at our disposal both to prevent accidents and keep traffic moving. And while we’re not quite at the stage of the Google self driving car yet we are edging closer towards it. 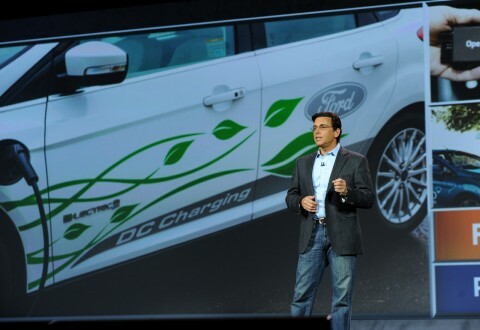 Ford used its keynote address at CES to announce 25 global mobility experiments, including seven projects for Europe. London based programmes include ‘City Driving on Demand’ which will see a pilot scheme of zero emission Ford Focus Electrics on the road, and ‘Painless Parking’ for which Ford has teamed up with a local authority to help people find parking spaces via a smartphone app. But that’s not all. At CES Ford also announced plans to extend its semi-autonomous cars programme with road testing of a new Ford Fusion Hybrid complete with ‘Lidar’ (derived from light and radar) sensors to generate a real-time 3D map of the surrounding environment. The Ford Fusion Hybrid will also include the manufacturer’s other semi-autonomous features including, wait for it, lane keeping assist, adaptive cruise control, pre-collision assist with pedestrian detection and active park assist, traffic sign recognition, rearview camera and auto high beams and rain sensing wipers (we’ve come a long way since the days when a hi-tech car meant one with a working stereo). With these additional sensors and advanced algorithms it will be possible for vehicles to predict where other vehicles and pedestrians are. But of course Ford isn’t the only company working on autonomous in car technology. At CES, Volvo also announced an innovative piece of tech that will allow drivers to detect when a bike is in their vicinity. The prototype helmet will also let cyclists know if they are in a vehicle’s blind spot so they can take action to avoid a collision. It works with popular smartphone fitness monitoring apps that track the location and speed of a cyclist. This information is then shared with any Volvo vehicles nearby that are equipped with the company’s City Safety system. This alerts drivers to the presence of a cyclist even if the rider is in a blind spot or when visibility is poor. The system also calculates potential trajectories of both bicycle and car and warns when a collision is imminent. Like Ford’s anti-collision technology, it can also take control of a car to apply brakes if it gets too close to a cyclist. Drivers will be alerted via the car’s head-up display and the rider will be warned through a light mounted on the helmet. Klas Bendick, a spokesman for Volvo, said: ‘By exploring cloud-based safety systems, we are now getting ever closer to eliminating the remaining blind spots between cars and cyclists to avoid collisions.’ According to traffic accident data 50 per cent of all cyclists killed on the roads collided with a car. BMW, meanwhile, used CES to unveil a new Parking Valet system for its BMW i3 electric car. The technology, called Remote Valet Parking Assist, allows the vehicle to drop off its passengers, before going to find a nearby parking spot. Using four lasers that search around the car at all times, the BMW i3 creates a map of the parking structure to find an empty space and park. It will then automatically lock all the doors and alert you by smartphone or smartwatch as to its whereabouts.